With sincerity and hard work of our experts, we have carved a niche for ourselves in this domain by offering Digital Gas Flow Meter. The offered flow meter is useful for measuring any gas flow rate especially for G.C. & analytical instruments. The provided flow meter is manufactured using superior quality components and advanced technology in tandem with defined industry standards. 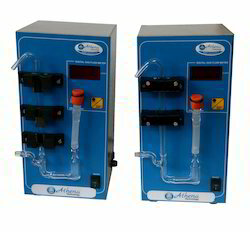 In order to ensure the functioning, this flow meter is stringently tested against practical parameters by our experts. Looking for Digital Gas Flow Meter ?